I can't identify this seedling! If anyone could help me figure out what this plant is, it would be very helpful. A bunch of these just started growing a few weeks ago. I dug up one of them, and they're growing from round black seeds. thank you! what have you had growing in that area? I' had basil, parsely, japanese eggplant and green beans growing near there last season. This year I've added lettuce and spinach seedlings too. if it's a very small round black seed, I think it's the lettuce. 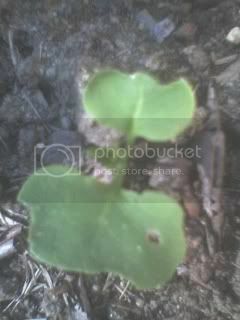 I have several different kinds started and the shape of the leaves looks like your picture. The first leaves of any spinach that I've grown are thin similar to grass. Hurrah! Thai Sun seedling! Oh no! Thai sun seedling!